It may seem counter-intuitive to suggest that writing is a generous act of the spirit, but I believe it to be true. I love the way books, music and movies can transport us into other worlds. I love how they open up the imagination. Writing is an act of self-expression, that is true. On the face of it, that can seem selfish. Your piece contains your worldview if it’s an essay or blog post, or the world you construct in your fictional dream, if it’s a novel or short story. I would be failing to fully disclose if I didn’t confess to loving the world I created on the Greek island of Patmos when my novel’s character Tara (“Searching for Persephone”) arrives at the mosaic art studio in which her mother and Octavio live or the salon night gatherings around food, wine and music that Tara and her sister, Paulette, are known for in their New Orleans neighborhood. It became much clearer to me that a writer’s role to the reader is as mentor, not hero, after I saw this TED talk from Nancy Duarte, “The Secret Structure of Great Talks.” In it, she says the audience is the hero, and the speaker is the wise person. The writer, then, is this sage. The writer is mentoring the reader to new heights of illumination. The writer seeks to stir in the reader new insights that affect the way the reader shall live her life — in subtle, mysterious ways that keep the reader linked to the experience of what it means to be human. Writing is an act of emptying, and writing is an act of bringing forth. We must reach that point of stillness so that we can be empty. 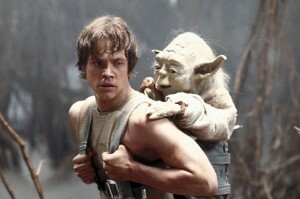 This is how we become little Yodas — we go to frontiers of the imagination where others don’t go. I believe it’s particularly valuable in a frenzied culture, where few of us do cultivate a practice of stillness, in which too many of us sublet our imaginations to junk entertainment. As writers, the generosity is in letting ourselves be empty so that something wiser may fill us. The generosity is in taking that leap of faith. As only Yoda could speak.